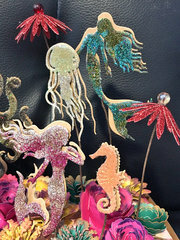 You can never have too much sparkle on your projects! 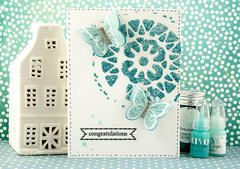 Get creative with the Turquoise Pure Sheen Glitter by Tonic Studios. Included is 3.38 fluid ounces of glitter, which is part of the Nuvo Collection. Talk about getting bang for your buck! These are big bottles! (and pretty too :) And I like them better than the little tubs--easier to pour and not spill, etc. Also I wanted a handful of glitters with super rich color and I wasn't disappointed! Gorgeous color! Gorgeous sparkle--you really can't get more sparkly. I love nuvo glitters. I bought several brands this year and nuvo wins, hands down.